“I’m angry,” Hillary told her friend. And exhausted. After two brutal campaigns against Sanders and Trump, Hillary now had to explain the failure to friends in a seemingly endless round of phone calls. That was taking a toll on her already weary and grief-stricken soul. But mostly, she was mad—mad that she’d lost and that the country would have to endure a Trump presidency. In other calls with advisers and political surrogates in the days after the election, Hillary declined to take responsibility for her own loss. “She’s not being particularly self-reflective,” said one longtime ally who was on calls with her shortly after the election. Instead, Hillary kept pointing her finger at Comey and Russia. “She wants to make sure all these narratives get spun the right way,” this person said. Mrs. Clinton then ticked off the number of times he had deemed a system rigged when he suffered a setback, noting he had even called the Emmy Awards fixed when his show, “The Apprentice,’’ was passed over. Now it is Clinton and many of her supporters who refuse to accept the results, sticking with a script to blame others which does not hold up to scrutiny. The Wikileaks releases of hacked email hurt because it verified criticism that the DNC had violated its own rules in rigging the nomination for Clinton, and in showing Clinton’s dishonesty. There has been absolutely no evidence that anything released by Wikileaks was not accurate information. In blaming Russia, Clinton is admitting that the facts about her and the DNC were sufficient to sink her campaign. Despite blaming the media, Clinton’s violation of the rules regarding her use of the private server was confirmed to be in violation of the rules in effect in 2009 by the Obama administration State Department Inspector General Report. Fact checkers repeatedly showed that Clinton was lying about the email and Foundation scandals. It was Clinton who grossly violated the ethics agreements she entered into before being confirmed as Secretary of State. Hillary Clinton, not the press, was responsible for this story. In blaming James Comey, Clinton ignores the fact that James Comey would not have been investigating her in the first place if she had not grossly violated the rules regarding email and hadn’t handled classified information in a careless manner. The investigation further hurt Clinton as Comey’s report demonstrated that she had repeatedly lied in her public statements about the matter. This gave further credence to her reputation of both seeing herself above the law and of being dishonest. She further hurt herself when she repeatedly lied about what James Comey had reported. Hillary Clinton brought this all on herself. Clinton lost due to both her own flaws, and the foolishness of those in the Democratic Party who supported her for the nomination, even to the point of violating their own party rules to rig the nomination for Clinton. Of course the problems are not limited to 2016. Democrats also lost badly in 2010 and 2014 by ignoring principles and running as a Republican-lite party. By 2016 their presidential candidate was a major supporter of the Bush/Cheney agenda on interventionism, enlarging the surveillance state, economics, and limiting government transparency. Clinton had largely become the establishment Republican candidate, with support from the neoconservatives, running against Donald Trump’s outsider campaign. The Democratic Party will not be able to recover unless it faces the facts as to why it continues to lose. We are seeing this again on health care, with the Democratic leadership running away from support for a single payer plan, as Bernie Sanders promoted during the 2016 campaign. 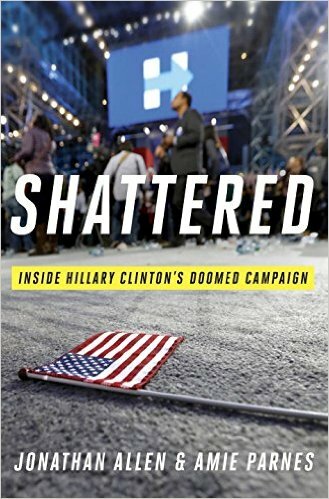 I have previously posted excerpts from Shattered here, here, here, and here, and have discussed why Clinton lost in multiple additional posts. Also see the excerpt I have posted from Insane Clown President: Dispatches from the 2016 Circus by Matt Taibbi on Hillary Clinton, which provides further insight into why Hillary Clinton should not have run for president in 2016 in light of the manner in which she used her political influence in an unethical manner to make money. Posted in Bernie Sanders, Donald Trump, Hillary Clinton, Scandals. Tags: Bernie Sanders, Donald Trump, Health Care Reform, Hillary Clinton, James Comey, Politics, Russia, Scandals, Shattered, Vladimir Putin, Wikileaks. RSS feed for comments on this post.. TrackBack URL.